Now I know where Carlin’s heart is: Scent Work. How do I know this? The evidence occurred at last weekend’s Scent Work trial in Blackfoot, Idaho, put on by the Upper Snake River Valley Dog Training Club. In the Advanced-level Scent Work classes, the judge can use a non-food distraction: a toy, a light, or a noise. The dog needs to be able to ignore the distraction and keep working to find the hidden scent. This is harder for some dogs that others. Some dogs just can’t resist a tennis ball or a stuffed toy. And some distractions are more distracting that others. So when I saw a Dokken duck sitting in the very middle of the Advanced Exterior search area, my heart sank a bit. A Dokken (officially known as a Dokken Dead Fowl Trainer) is a somewhat-lifelike imitation of a bird. Retriever and spaniel trainers use them for training their hunting dogs. 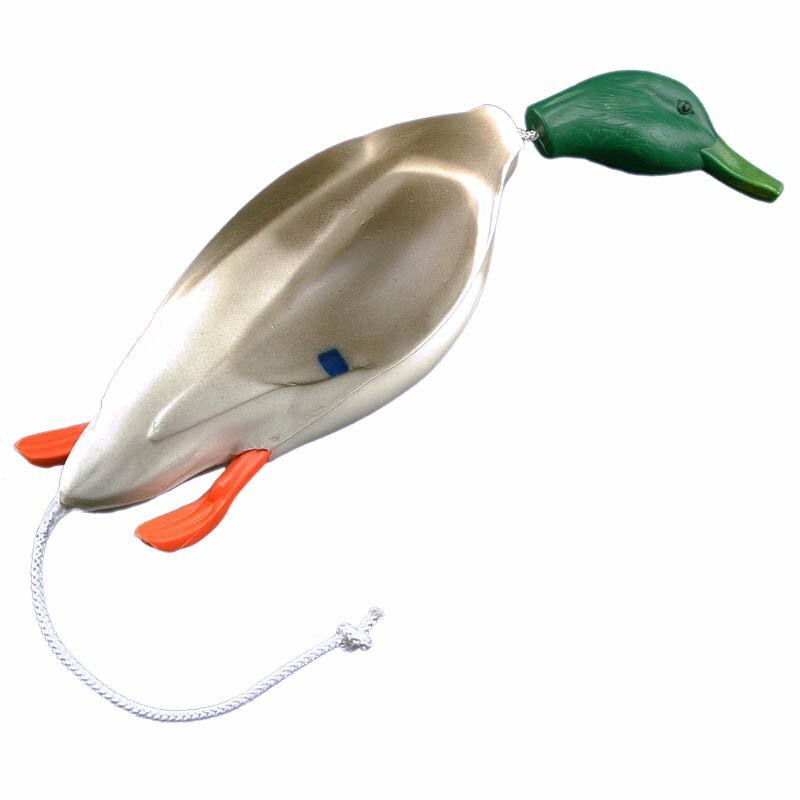 A Dokken is about the size, weight, and coloring of a real bird, such as a duck, pheasant, or dove, but they don’t have feathers, and, unless you inject yours a special bird-scent compound, they smell like the plastic they’re made of. In training for his hunting career, Carlin has been heavily rewarded for picking up and delivering Dokkens to hand. So I thought there was a distinct possibility that Carlin would pick up that Dokken and try to deliver it to me. It’s not against the rules for him to pick it up, but it is against the rules for me to touch him or the distraction. And if he found it so distracting that he couldn’t find his hides, then, well… Then we fail. There’s not a lot I could do to deflect Carlin if he was determined to get that Dokken. He moves very fast in search areas, and often I can barely keep up with him. So, I just took a deep breath, took a hold of his harness, told him to “Find it!”, and let him go. And what did he do? He jumped right over the Dokken, and ran straight to the scent hidden under the edges of a plastic box set a couple of feet beyond the Dokken. Having found that and gotten his chunk of dried liver, he took off again, looking for the second hide, which he found expeditiously in the corner of a garage door frame. The whole search took him 41.8 seconds. Now, of course, if the distraction had been a real duck, pheasant, chukar, or dove, the results would likely have been way different. But fortunately, using a real bird wouldn’t be allowed. So we’re safe there. 2nd Place in Exteriors Advanced at 31.69 seconds. 1st Place in Interiors Advanced at 49.13 seconds. a Q in Buried Novice at 16.13 seconds. 1st Place in Exterior Advanced at 41.80 seconds. 3rd Place in Container Advanced at 47.71 seconds. 4th Place in Interior Advanced at 1 minute, 21.04 seconds. 4th Place in Buried Novice at 17.30 seconds. This third pass in Buried Novice got him that element title. 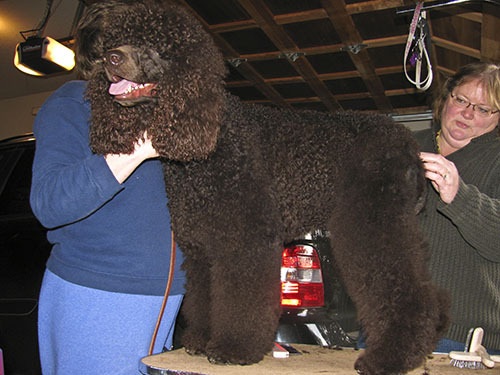 And having gotten his fourth Novice element Novice title means he’s earned the Scent Work Novice title (SWN).